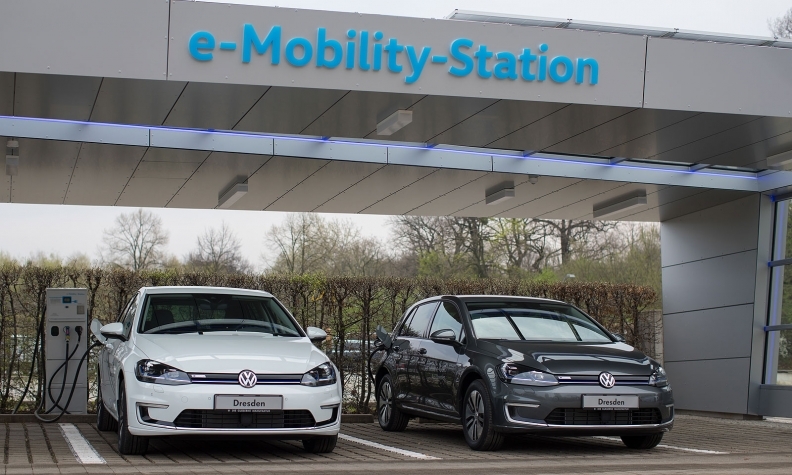 Volkswagen e-Golfs at a solar-powered charging station outside the VW factory in Dresden, Germany, in April. FRANKFURT -- Germany's powerful auto industry said Europe would need to reassess its environmental standards to remain competitive after the United States said it would withdraw from the Paris climate pact. President Donald Trump said Thursday he would withdraw the United States from the landmark 2015 global agreement to fight climate change, drawing anger and condemnation from world leaders and heads of industry. "The regrettable announcement by the USA makes it inevitable that Europe must facilitate a cost efficient and economically feasible climate policy to remain internationally competitive," Matthias Wissmann, president of the German auto industry lobby group VDA, said in a statement on Friday. "The preservation of our competitive position is the precondition for successful climate protection. This correlation is often underestimated," Wissmann said, adding that the decision by the Unites States was disappointing. The VDA represents automakers including BMW, Volkswagen, and Mercedes-Benz parent Daimler. The VDA's warning comes as German Chancellor Angela Merkel, one of the strongest advocates of the global pact to curb emissions of gases that speed climate change, said there was no turning back from the 2015 Paris climate agreement.